If you love the zeal and zest that Navratri brings each year, then you’re in the right place!! There will be lots of music, dance, entertainment, Bollywood songs with dandiya beats & DJ. The event is for the youth and families to enjoy the ever amazing festival of Navratra. Come and dance together as a community !! Just grab your tickets now and create some life long memories with your family and friends. Premier Tickets is an online event marketing and ticketing agency. Premier Tickets will NOT be responsible for any changes related to the event schedule, artist, venue or cancellation and refunds related to the tickets for BALLARAT GUJJUS PRESENTS NAVRATRI (DJ GARBA NIGHT) 2018. 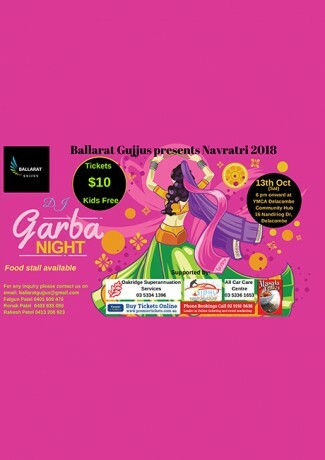 Premier Tickets Australia is proud to be the online ticketing partner for BALLARAT GUJJUS PRESENTS NAVRATRI (DJ GARBA NIGHT) 2018 @ YMCA Delacombe Community Hub.